Are there resources that you recommend to teachers and students for them to start exploring the design side of 3D printing? Design is one of the biggest questions that I think any user, not just teachers or students would have, but any user of 3D printers, has. Where do I get the things I want to print or how do I create the things that I want to print? And there are many, many resources out there to do that. I'll break it down into two classes. One you can take resources that have already been created by others. There's a website called Thingiverse (Thingiverse.com.) That's a site designed to allow users to share models or things that they've designed with anybody else in the world with their permits of licensing on those. YouMagine is another example. It's an online community for everyone who’s eager to explore the world of 3D printing. You can just download a file, or project, which somebody else designed and load it into your printer and print. That's a nice way of doing it. The neat thing about a lot of those sites, or a lot of the users, is that they also post the source files for those. So they might have designed it in Trimble SketchUp, (sketchup.com), or Tinkercad. They can design it in those tools, and they include the source files so that you can go and modify and do whatever you want to. The other side of that, is again, the designing of the project themselves. SketchUp or Tinkercad, those sites are fantastic for learning how to build three-dimensional objects. We're going to start off with a simple two-dimensional object, and then we'll extrude it up into the third dimension. One other fantastic resource that most of us adults don't use, but kids use it all the time is something as simple as Minecraft. Microsoft bought Minecraft recently and we've seen a huge explosion of tools built around this concept of using blocks to build objects. Now we did it as kids using Lego's, but the benefit that the kids have today with these tools is that they can size the Lego's differently, digitally, and they can zoom into a small spot and put really tiny Lego’s to make it fine detail, and then when we zoom back out, you just see a smooth surface. The neat thing about that is the printer or these tools that work like this will generate the appropriate files for 3D printing. In addition, Minecraft has a service called Printcraft that you can actually develop something in Minecraft, and then send it to the Printcraft server, and it will email you your SDL file which you send to the printer. 7th-grade students are highly interested in 3d printing. In fact, they can overwhelm a teacher with print requests as they come up with new ideas. That is what was happening to me in my 7th-grade Design and Modeling classes. I was spending lots of time handling the details of every single print, and it required too much of my focus. So this semester I “flipped” the process! I ordered more Polar3d printers, and I gave the print process to the students. My students sign up to the Polar Cloud, and I send them invitations to join my classroom club. Wow, what a difference. I no longer prep the plate, start, monitor, remove from the plate, etc. Students are instructed to monitor their prints via live stream from their devices and to shut down the print should there be an issue. The students do it all, and they love it. The students are learning from their print mistakes and are modifying their designs to make improvements. Isn’t this what we want? 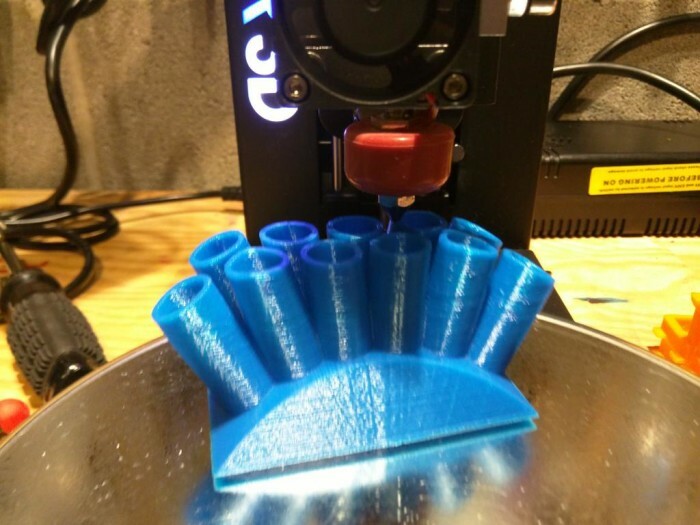 The design to print time has decreased greatly, and students love the freedom they have to experiment. When my new order arrives, I will have 10 Polar3d units for a student to printer ratio of 14 to 1. I am hoping that that ratio will handle the demand. I would highly recommend to any teacher to stop being the 3d go-to person. When my new order arrives, I will have 10 Polar3d units for a student to printer ratio of 14 to 1. I am hoping that that ratio will handle the demand. I would highly recommend to any teacher to stop being the 3d gate-keeper. Give your students ownership and some freedom to fail and then watch them get creative! They will not hurt the Polar3d units if you show them the basics. The attached pictures shows a typical scene for me in the morning. Student prints that started at the end of the school day are ready the next morning. 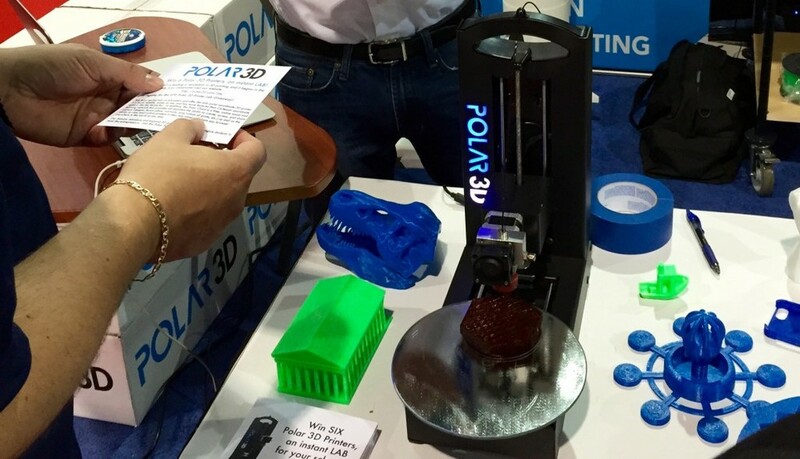 How is 3D Printing and the Polar 3d Desktop printer transforming the classroom? Nationally syndicated radio host Frankie Boyer discusses this with Polar 3D co-founder William "Bill" Steele on BizTalk Radio. Mr. Thomas Dubick, of Charlotte Latin School and Founder of Young Engineers Of Today, presents an in-depth introduction to the Polar 3D Printer, including tips and techniques.